I roam the city through self-guided walk accompanied by a downloaded map online starting from the hostel where I booked-in (Hostel Blues). I passed-by the Grassalkovich palace (residence of the president of Slovakia), Michael's Gate (only city gate that has been preserved of the medieval fortifications), Trinitarian Church, Old Town, Bratislava Castle, Church of St. Elizabeth (Blue Church) and how locals and other tourists hassles on the streets. Photography and video taking is allowed. 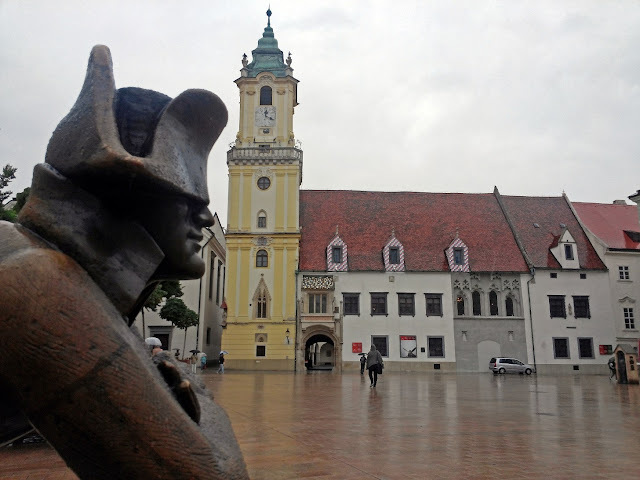 Bratislava has a very pleasant medieval inner city with narrow, winding streets, a hill-top castle next to the river Danube, and many historic churches and buildings to visit. The old town is centered on two squares, Hlavne namestie (main square) and Hviezdoslavovo namestie (Hviezdoslav square, named after a famous Slovak poet).